With the new DotLoop out there are some changes in the way the system works. This is great news because it gives you more freedom to manage your business the way YOU want to! Let’s get started on Creating New Loops! Log into your dotloop.com account. You can access it through your mykw.kw.com login and then click on the myTransactions in your eEdge dashboard. Once on your DotLoop/myTransactions home page click on the big plus button to create a loop. Once you have created a new loop, you have several options on where to start and I’m going to take you through the “best practice” method. 1. Start with the “Edit Details” under the loop name. 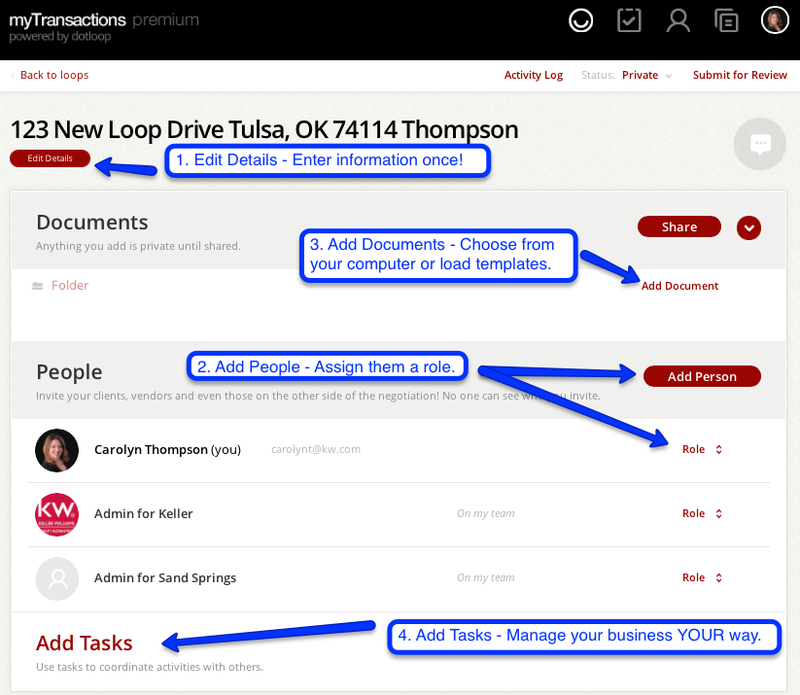 When you complete the information listed in that section it will auto populate to your contracts and forms if that information is listed in the details. I would much rather enter something once as opposed to entering it multiple times on multiple documents. 2. Add your People next. 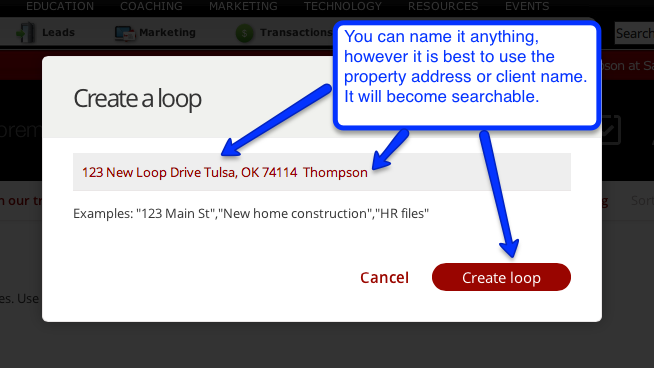 You will also want to assign them a “role” so that the loop knows who they are to the transaction. This will also save you time as you add documents and forms. 3. Next add your documents. There are several ways to do this: a. Drag the file from another place on your computer and drop it in the box, b. “Select from your computer” and find the document on your computer and select it, or c. “Select from your Templates” is the best option because it allows you to use the interactive forms loaded into DotLoop. These “templates” are your state or office forms that have been loaded and they can be grouped in folders by your office or yourself for organization and easy access. 4. The last section is for “Tasks”. We truly did save the best for last because this is where you can manage your file. This section allows you to create lists of things to do, calls to make, or things not to forget. The system will automatically add an “Urgent Tasks” when you forget or chose not to sign a form. This reminds you to go back into a document to complete it. Once you have created your list, you can also “Create a Template” of that list so that you don’t have to retype it each time you want to use the same list. Next time you will just select “Load Template” and you are good to go. If you would prefer to watch a video, click here to go to DotLoop’s training videos. Well, that’s it for the basics of creating a new loop. Just remember, you can’t break it, so it’s ok to create a sample loop and try things out! Happy Looping!